The painter John Atkinson Grimshaw arrived into the world on the eve of the Victorian era, in September 1836. Born in the northern industrial town of Leeds, he went on to became one of the most popular figures among the golden age of British art. Grimshaw had a fairly steady upbringing (his father was a policeman, his mother ran a grocery store, and both were strict Baptists). Therefore, as might be expected, his first career was steady too, as a humble railway clerk rather than an artist. This unremarkable young life also included a marriage to his cousin Frances in 1856. However, despite disapproval from his parents, the creative spirit gradually surfaced. Encouraged by his young wife, he left his job with the Great Northern Railway at the age of 24 to become a painter. Though aided by the patronage of the Leeds Philosophical and Literary Society, he was largely self-taught. He first sold his work through a local bookseller. By the early 1860’s, however, he had begun to exhibit his pictures more widely and his reputation as a popular landscape painter of nocturnal and melancholic autumnal scenes grew apace. Today he is regarded as one of the best, if not the best interpreter of nocturnal landscapes of the 19th century. Wharfedale, 1872 - John Atkinson Grimshaw. As success grew, he moved into a grand old mansion on the outskirts of Leeds. This was the 17th-century Knostrop Hall (pronounced Knowsthrope). It was a grand, sprawling old building and became the subject or background of many of his paintings. Build by Adam Baynes, Member of Parliament for Leeds during the time of Cromwell’s Commonwealth, it was already ancient by Grimshaw’s day. Its noble decay and faded grandeur perfectly suited the artist’s passion for atmospheric surroundings. One can imagine Knostrop today as making a fine museum to house Grimshaw’s work. It was so inextricably linked to his career and domestic life. But sadly, it was demolished in 1960. A waterfront nocturnal view of Knostrop. 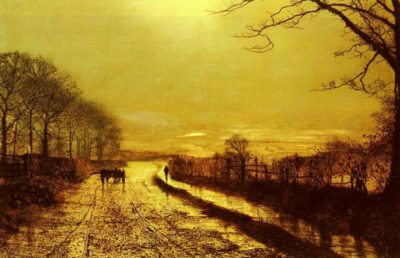 An early influence on John Atkinson Grimshaw was the Pre-Raphaelite movement. He was attracted to their philosophy of faithful rendering of nature and detail, while incorporating a fondness for allegory. Some of his earliest images were still-life studies, including flowers, fruit and macabre subjects such as deceased birds. A Dead Linnet by John Atkinson Grimshaw, 1862. But gradually his own style and choice of subject matter came to the fore. And he began to concentrate more on what were to become his trademark nocturnal landscapes. But there were other influences. 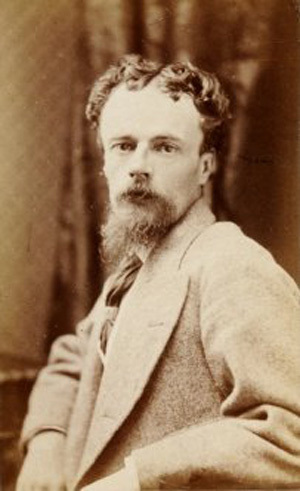 Like many artists and writers of the times, Grimshaw was profoundly affected by the Romantic poets - and in particularly by the works of Alfred Lord Tennyson. 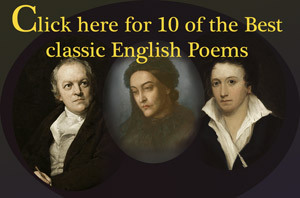 He even named his children after characters in Tennyson’s poems! Gertrude, Enid, Arthur, Lancelot and Elaine, and so on. Tennyson from a painting by Friedrich Bruckmann. There is no evidence, by the way, that the two men ever met. But Tennyson’s brooding sentiments, and his tragic heroes and heroines definitely struck a chord in the imagination of John Atkinson Grimshaw. During his early years, he did not paint too many portraits or single figures (apart from the very small, anonymous ones in his landscapes). But he did do Tennyson’s Lady of Shalott. He painted this subject twice. Another, similar theme, was of Elaine from ‘Idylls of the King.’ Each is set upon a river in their respective funereal boats. 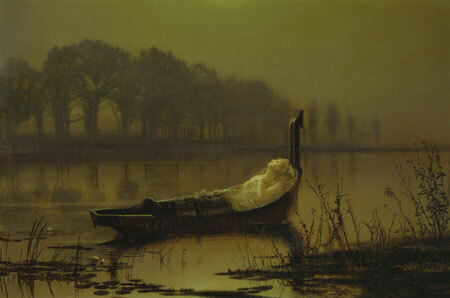 Lady of Shalott by John Atkinson Grimshaw, 1875. All these influences contributed to Grimshaw’s process of artistic discovery. Blended with his own unique and practical approach to composition, there arose a very attractive and unmistakable Gothic style. Dark, mysterious and atmospheric. Moonlight, autumnal colours, old buildings and gas-lit streets populated by small, barely-defined figures. These are all regular features in his works. Incidentally, it’s worth remembering that at the time, gaslight - especially in rural areas - was still a relatively new invention. A novelty for some. Grimshaw, like many others, was clearly fascinated by it. Grimshaw’s compositions also display a certain sense of alienation - of the figures being apart from things. They are, for example, often to be found gazing at buildings from the outside. There is a certain melancholic wondering at the warm glow of illuminated windows. A sense of longing for comfort and inclusion that gives an added dimension of eeriness to many of his more rural compositions. Even in his towns and cities, many of the figures are found standing, waiting, looking into illuminated shop windows. 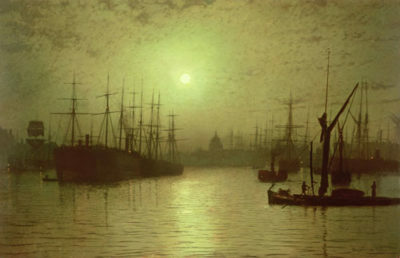 Grimshaw was also attracted to river landscapes and to dockland scenes. The Humber and the harbours of coastal towns such as Whitby and Scarborough were lifelong attractions. And it was in Scarborough, within easy reach of many of his favourite locations, where he rented a second home for a time in the 1870s. He clearly enjoyed domestic and family life at this time. He and his wife had 16 children in all, though sadly only 6 survived to adulthood. Canny Glasgow, 1887 - John Atkinson Grimshaw. It was during the 1870’s that John Atkinson Grimshaw converted to Catholicism, and towards the end of the decade he seems to have gotten a little ahead of himself in terms of lifestyle. A financial crisis ensued. He fell into debt. And this might have had something to do with his moving to London for a short while during the 1880’s, perhaps to increase his revenue. Whatever the reason for the change, he did very well in the capital. He had further pictures accepted for the annual Royal Academy exhibitions, and also by the prestigious Grosvenor Gallery. And he produced some memorable depictions of London, Westminster and the river Thames. Reflections on the Thames Westminster. One possible scandal is recorded around this time. In 1879 Grimshaw invited a young woman, Agnes Leefe, to live at the family home of Knostrop Hall. She was an actress at the Leeds Grand Theatre. Her purpose was to be a live-in model, but her job description was varied - including ‘studio assistant,’ ‘governess’, or ‘lady’s companion.’ Apparently, Mrs Grimshaw was not entirely happy with the arrangement. It is interesting to note that the year 1879 coincides with the aforementioned change of fortunes in the artist’s life and the lengthy series of journeys to London. Agnes accompanied him, moreover. An affair? There is no evidence either way. So we should perhaps give Mr Grimshaw the benefit of the doubt. Nightfall Down the Thames, 1880, John Atkinson Grimshaw. Although these few short years in the south appear to have been a commercial success, he returned to his native north soon enough. And here he remained at his beloved Knostrop until his death in 1893. Agnes, still resident, died a little earlier in 1890. His wife Frances survived them both, however, passing away in 1917. By then Grimshaw’s important contribution to the story of Victorian art was assured. And among his children, four had already become painters in their own right. Today, his work can be seen in galleries as far afield as: Bradford; Gateshead; Halifax; Harrogate; Huddersfield; Hull; Kirklees; Leeds; Liverpool; London’s Tate and the Guildhall Art Gallery; Preston; Scarborough; Wakefield; Whitby; Hartford; Kansas; Minneapolis; New Haven; New Orleans; Rhode Island; Victoria and Port Elizabeth. Of course, Grimshaw’s paintings are not everyone’s cup of tea. Dark in tone. Heavy in sentiment and populated by brooding figures set before tall Gothic buildings or lost in vast city streets, they can be perceived as being rather … well, grim. In his day, he also attracted a fair bit of opprobrium due to his extensive use of photographic sources for reference. Rumours were that he projected photos onto blank canvases and sketched in the outline of buildings and trees. It is even thought that in some cases he may have worked directly onto a photographic underlay, building up the paint on top of the image. All this was tantamount to practising the dark arts in the conventional art establishment of the time. Close-ups showing detailed outlines in black - is it paint or pen & ink? His work also combined different mediums - such as, what looks to me in some instances, to be pen and ink outlines with thin washes of paint on top. Sometimes, it is almost as if he uses oil paint like watercolour. Even at the time, his critics complained that it was difficult to detect brush strokes or textures. Though, contrary to this, he is also said to have mixed sand into his paint to create effects. In other instances, he applied the paint so thinly that the texture of the canvas showed through, adding a certain sparkling effect. John Atkinson Grimshaw, At The Park Gate, 1878. In a sense, Grimshaw’s work is as inscrutable as the man himself. An enigma. He left little evidence of his personal life to posterity. No letters, no diaries, and very few documents of any kind. Does it matter? I for one have always loved his work. His landscape is one in which many a writer’s imagination flourishes. Finally, as a little tribute, here is a video I put together containing some of his most evocative paintings. Elizabeth Siddal. A reminder of why we remember.